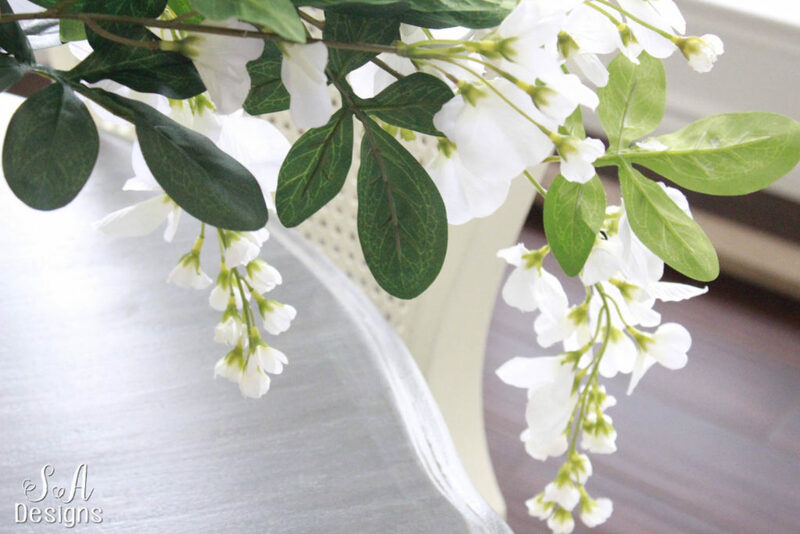 Do you need ideas to style your home for Spring? My friends and I are sharing 14 different ways today so get ready to start pinning and being inspired! Spring is less than a week away! Welcome to all of you coming from Maison de Cinq! I recently met Sheila at the Design Bloggers Conference (more on that coming soon, I promise) and can I just tell you….she is as lovely and as sweet as she appears on her blog! Sheila is just a genuine, talented, beautiful and kind soul and I adore her! I’m sure you know that by now and I’m sure you loved her Spring tips as much as I did! Welcome, once again, to all my regular readers and I’m so glad you’re here! 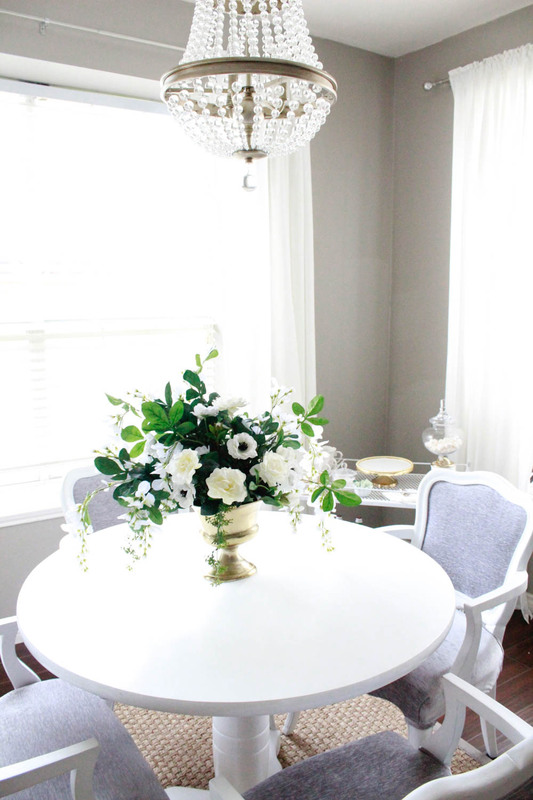 Just 2 days ago, I shared how I styled my master bedroom and dining room for Spring and refreshened it a bit. You can read all about it HERE! 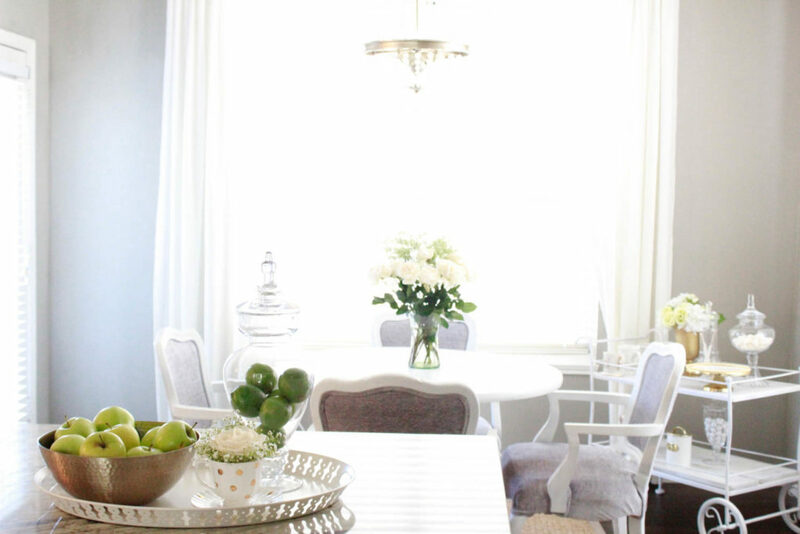 Today, I’m sharing with you my kitchen and nook decor for the Spring. You may notice that I’m using a certain color throughout the entire downstairs of my home. I’ll be sharing my family room and living room on another day and you’ll see even more of this color. Here’s a hint…it was chosen as Pantone’s color of the year. Yep! Green! I just love it so much. It says “rebirth” and “fresh” and “new” and “alive” to me, when I think of everything blossoming and growing once again. So I brought that feeling inside. I’ve been trying to keep more fresh fruit and veggies readily available to my kids (washed and cleaned) so that they’ll just grab it and go, instead of a packaged snack. 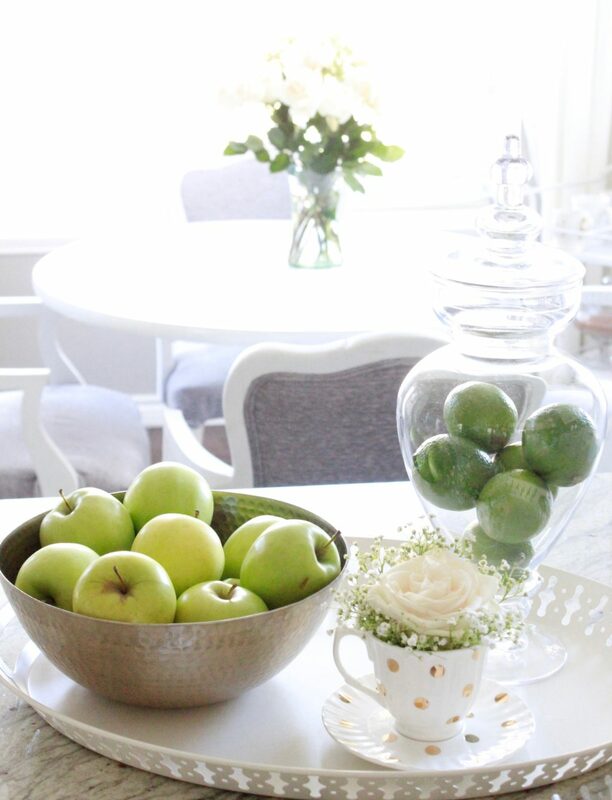 These delicious green apples double for decor too in that lovely gold bowl. If you remember, I shared how I added gold and brass to my kitchen last year. 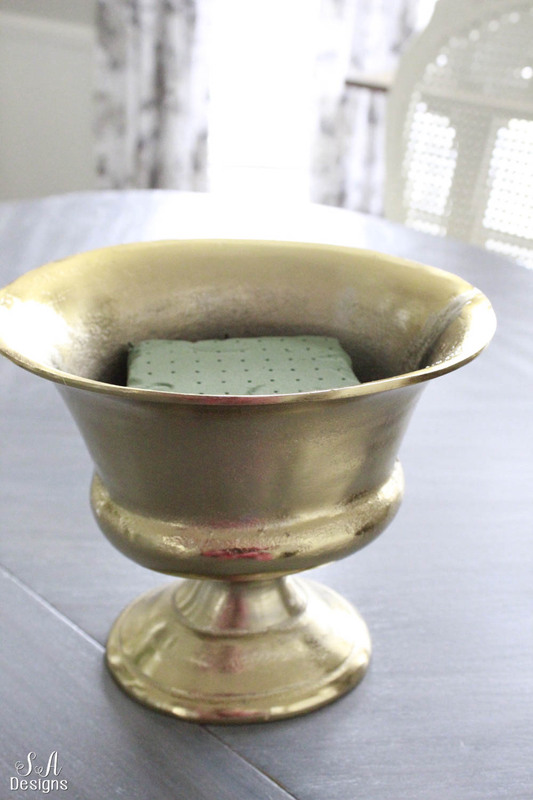 So another pretty pop of gold, besides the bowl, is this cute little teacup with gold polkadots. 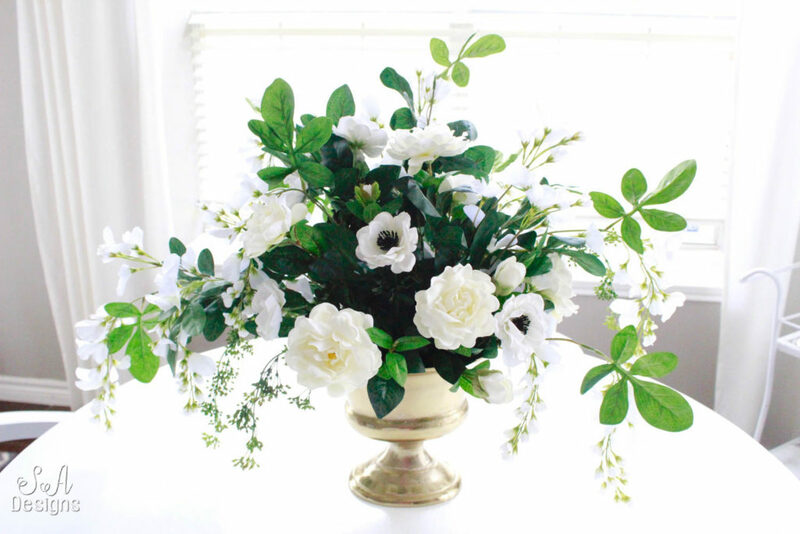 I happened to have some fresh white roses and baby’s breath in another room so I stole just a little from that other arrangement. With some plant food, it stayed gorgeous like this for over a week! Crazy right?! I was thrilled. It’s so fun to use what you have. Just look around you! And if you have been following along with me for a while, you know I love my Dirty Diet Cokes, which call for limes. So I always have those on hand and thought I’d wash and clean them and have them ready to go in a pretty apothecary jar. When the roses on that kitchen nook table (previous picture above) finally died, I decided I would do something I did HERE when I wanted to keep peonies around all year long. 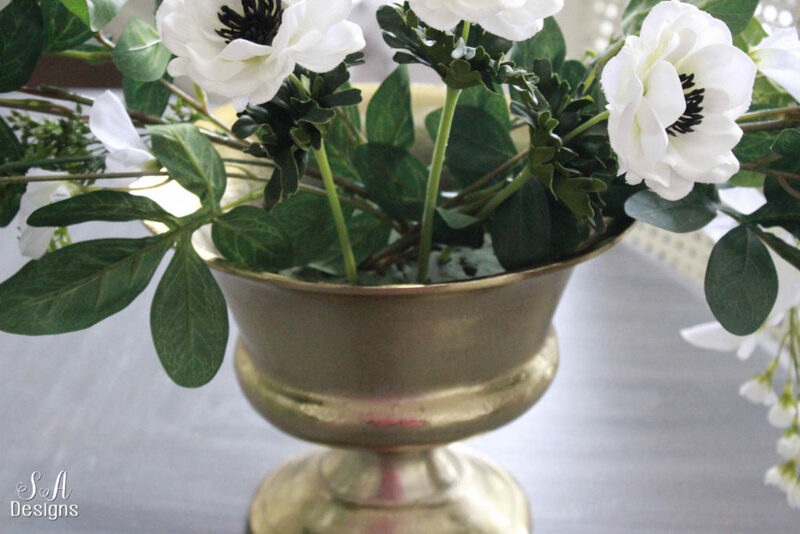 My friends from AFLORAL were kind enough to send me some gorgeous faux stems and this gorgeous antique gold floral urn to create a fabulous faux floral arrangement. Why? I knew I had a LOT of traveling going on this spring and I didn’t want to keep buying fresh flowers every week, just to turn around and hop on another plane and come home a few days later to dead flowers. I love my husband and children. But they do NOT understand that you have to look after your blooms. Afloral sent me some seeded eucalyptus hanging spray stems so I put them in the floral foam brick, hanging off the sides. I also used wisteria bushes and had them hanging over the sides. They’re so pretty! 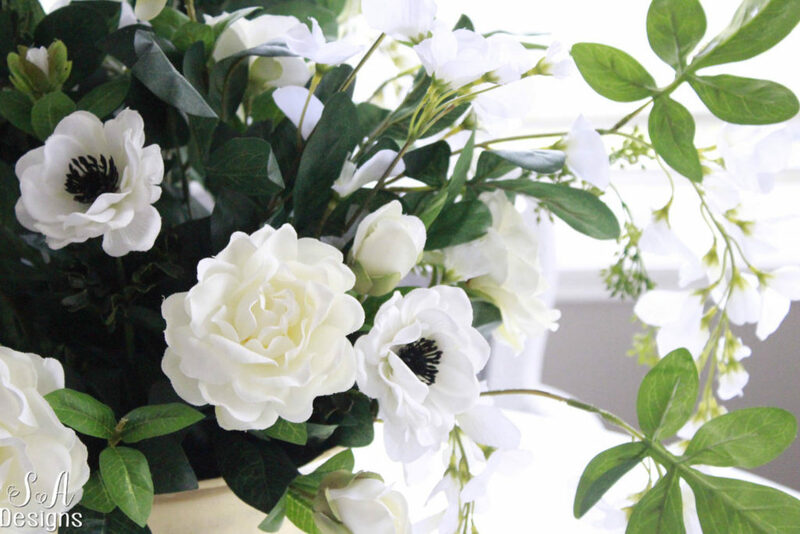 and I also used a few mini white peony bushes to use for a great filler. I just cut them the sizes they needed to be and stuck them in the foam brick. Isn’t it gorgeous?! So, about 45 minutes after I was finished with it, a friend dropped by to borrow an ingredient she was in need of for her dinner. Her jaw dropped when she saw these and said from across the room, “Did you husband send you that? Wow that’s gorgeous!” I told her that he had not and to go take a closer look. She touched them and said, “I can’t believe it! They are faux!” That’s right. And that’s exactly why I wanted to order from Afloral because they weren’t your grandma’s “fake flowers”. Their faux real-touch and silk flowers (and dried) are all so gorgeous, as are their trays and vessels. I highly recommend them! 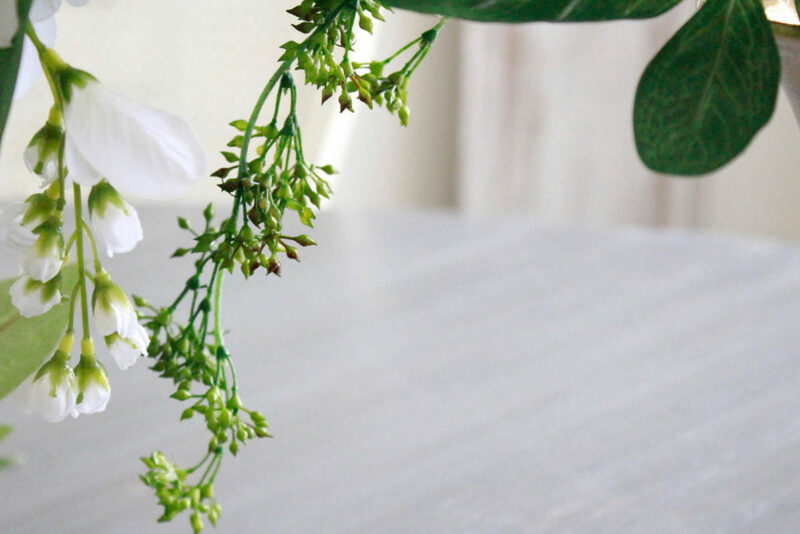 This arrangement makes such a statement and brings life to my little kitchen nook. 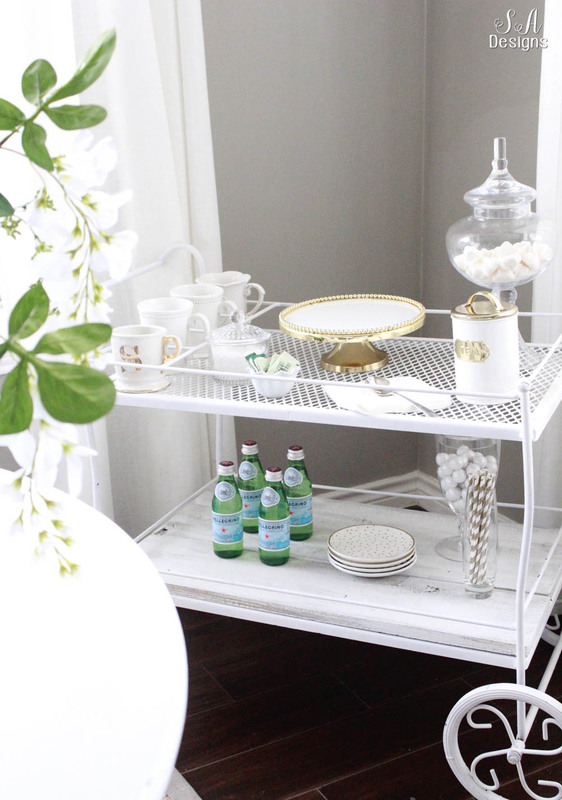 Just to the right of my little round table is that cute vintage tea cart that I decided to keep in the nook. This little nook needs all the fun it can get! I usually keep a Hot Cocoa Station on it during the Fall and Winter. 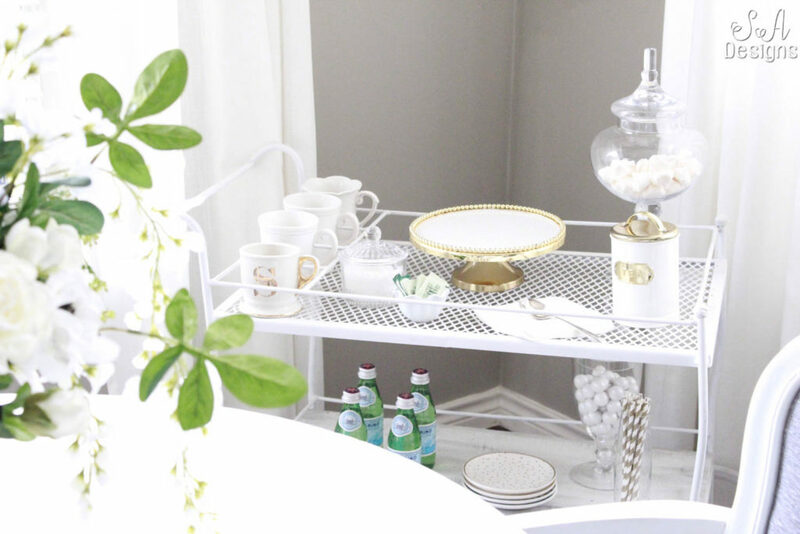 But now that it’s Spring, it’s the perfect place for guests to come and help themselves to some tea, sparkling water, make an italian soda, and enjoy a few sweets. You know I usually have something fresh coming out of the oven to put on that cake stand, right?! Well, I’m thinking it’s the perfect time for some Lemon Cream Cupcakes maybe? 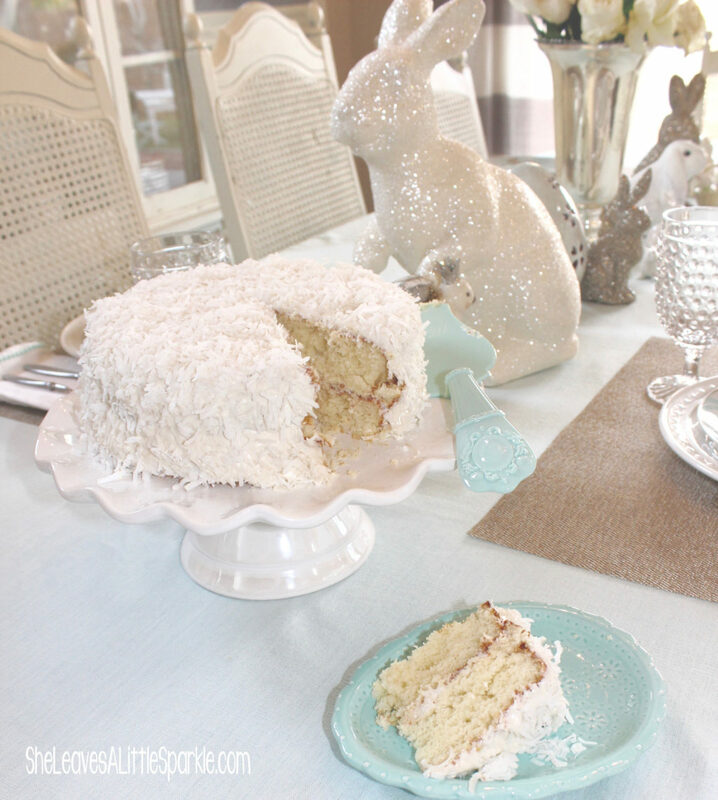 Or possibly this delicious Coconut Cake that I shared with you last Easter? Or Coconut French Macarons? (Oh gracious, I should NOT blog about desserts when I’m this hungry.) There are so many favorites. I suppose I’ll just have to bake them all! Just not in one week or you’ll see this blog turn into a “how to lose weight” blog haha. Thanks to Afloral for sending me such fabulous stems and that gorgeous vessel! I’ll be sharing a couple of other things they sent me next week! Here are some other pieces from my home (or similar items) that you may have seen in this post and I’m linking them below for your convenience. I’ll be sharing more of my home this Spring next week, but for now…hop on over to my dear friend Tamara at Citrine Living! You’re in for a treat because Tam is not only beautiful and kind but she has impeccable taste and her home is so lovely. You probably won’t want to leave BUT make sure you do eventually because these other fabulous blogger friends of mine are waiting for you to visit their homes as well. Love the arrangement and the flowers you chose. Beautiful as always! Oh Summer, This is absolutely breathtaking…. looks so fabulous!!!! 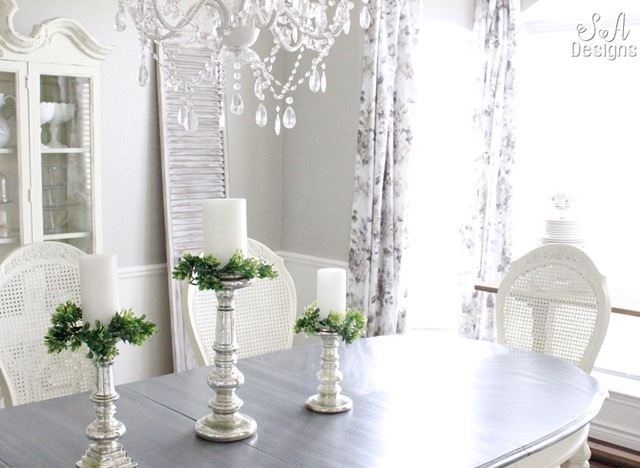 Love the touches of green and those beautiful faux flowers that look so real. Beautiful, Summer! Your home is beautiful all decked out for spring. But those desserts? 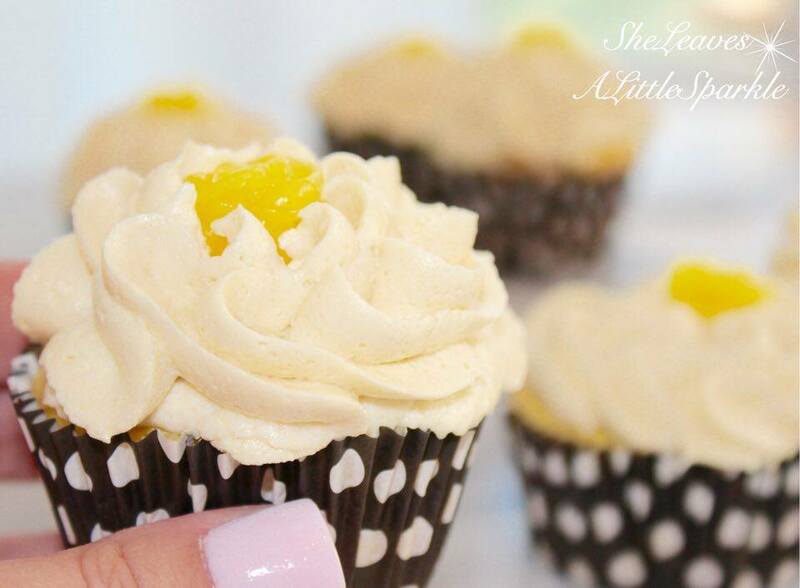 Lemon creme cupcakes and coconut cake are two of my favorite things on earth! Great post! Summer! Those gorgeous flowers!! 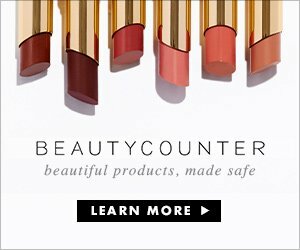 I am a huge fan of faux and these are spectacular! There’s nothing like fresh green produce to add that touch of Spring to the kitchen, and I love all of your gorgeous gold details 😉 You always do the best job of pulling it all together seamlessly! Summer what a pretty Spring display you’ve done here! 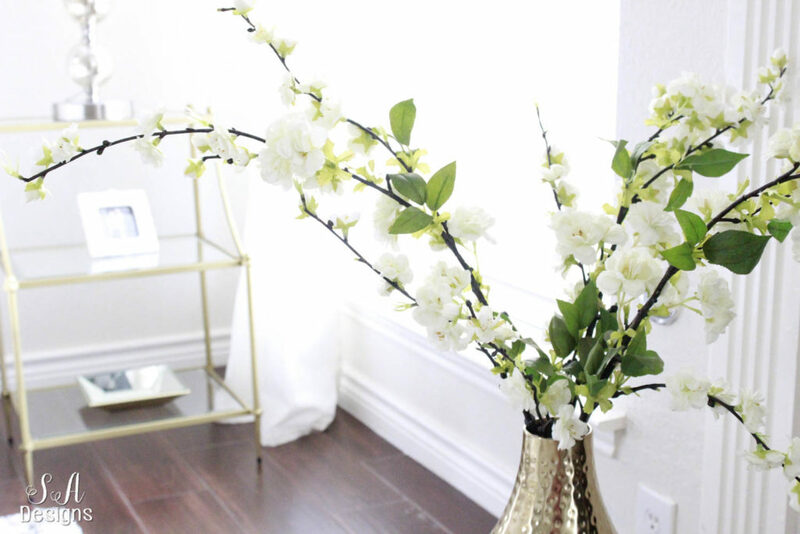 Im loving your faux floral arrangement it looks so real! And those desserts look soo delicious!! So happy to be teaming up with you again!! Summer I love your spring touches! I like how you have brought in pops of green and they’re all organic. And the warmth you added with gold. But your flower arrangement is to die for! Gorgeous!!! Summer, I just love this post! I think you’re meant for spring! I love your faux flowers (they look so real!) and I’m especially in love with the pops of green! It all looks so fresh and crisp – just what we all want for spring! That is so very kind of you, thank you my friend! So excited for spring! Bring on the warm weather! Omg. Coconut cake is my FAVORITE!! It looks beautiful as does the rest of your space. I love the touches of green for spring. It makes me hopeful for what’s to come once the snow melts. Me too Michael! It’s my weakness LOL… Anything coconut actually! Well it’s going to be 89° here in Dallas so if you need to get away from the snow, come down to the south! Beautiful Summer!! Those desserts look divine! You have a lovely touch to everything you do! I love all the touches of green, one of my favorite colors! And your floral arrangement is beautiful! You’re so sweet, thanks so much Bethany! Fun doing this tour with you! Your post is fantastic! Your voice and stories are so entertaining, it eeks your personality! I LOVE it! 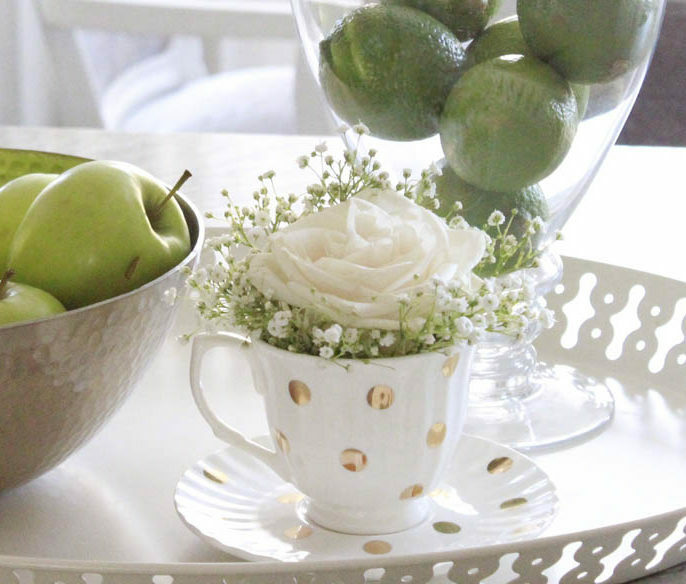 Your spring decor is so fresh and I love the pops of green. 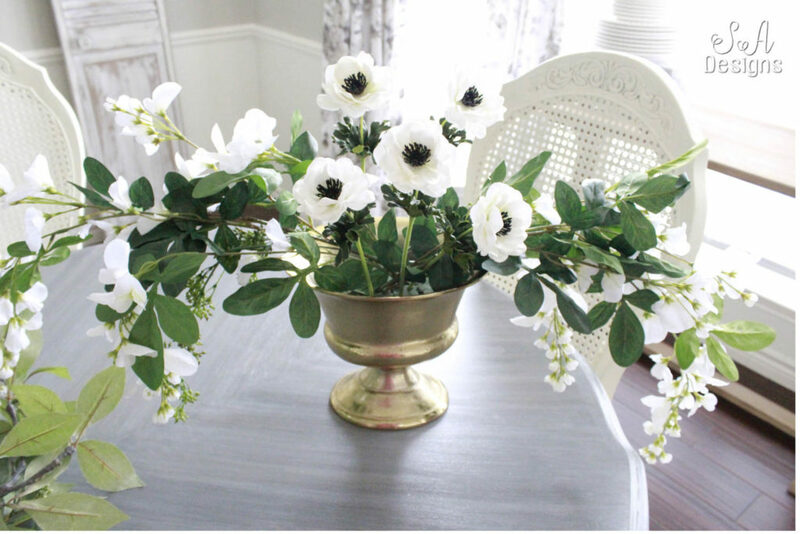 And can I say, that your faux flowers are just drop dead gorgeous in their container! Whoa!!! Love it, and off to share on FB!